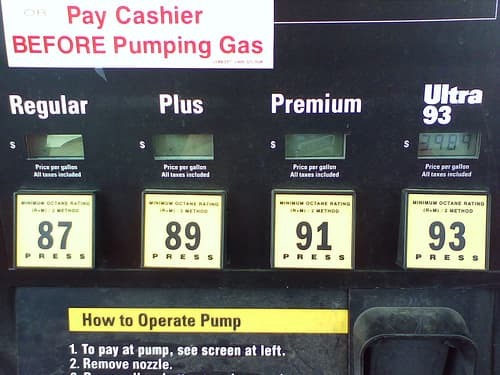 Should You Use Premium Fuel? Pickup truck owners likely want to get the best performance out of their vehicle. Putting the right fuel into a truck definitely will contribute to whether or not the vehicle operates properly. All will agree low quality gasoline should never be used. Whether or not the truck should take premium fuel, however, could be the source for a great deal of debate. The truth is, unless the manufacturer suggests putting premium fuel in the vehicle, then it might be best to stick with regular. The reason is there will be nothing extra really gained from using premium fuel. The owner would be doing little more than paying a lot of money for higher priced fuel with not real performance benefit. Now, the pickup truck’s manual may even say to only put regular in it. Following this advice is strongly advised. It is highly doubtful that the premium gasoline will damage the vehicle, but it is not going to contribute anything more to the performance. If there were clear and obvious performance benefits to gain, then spending more for costly gas would make sense. Generally, higher octane premium gas is suggested for luxury cars. These cars and trucks might have high compression engines and the higher octane fuel might very well serve a definitive purpose. The running theme here is, if paying more for the fuel serves no real purpose, then there is no reason so spend money on it when the money could go for other areas of car care. A common reason why some drivers will put premium gasoline into their vehicle is because they assume they are going to get a greater benefit from it. The assumption is they will gain better engine life thanks to the premium fuel put into the truck. Such a result is not going to occur. Another reason why some will opt to put higher octane premium fuel in their truck is because they believe they are going to get greater gas mileage. Actually, the opposite might be true. In other words, you might very well end up with lower gas mileage. This can be a true budget breaker. You are spending more for fuel, getting less gas mileage, and being forced to purchase even more gasoline. When the vehicle’s engine is knocking with regular fuel, then it just might be a good idea to move up to a higher octane. If there is no knocking, then you may not really have to worry about moving up another level. Some just might feel a little better about putting premium fuel into their truck or car. They can do so, but the money they are spending is for naught.